One house away from pool!! This rambling beach house and its guest house are popular and book up quickly! ‘No Crabs Allowed’ main house in Seacrest Beach development on highway 30-A is a spacious, professionally decorated beach house ready to be your perfect paradise getaway. Our Main House, ‘No Crabs Allowed’ and carriage house, ‘Just a Little Crabby’ is one house away from the incredible pool making it easy to run back and forth. It’s also an easy walk to the gorgeous, sugar-sand beaches or you can call the free, neighborhood trolley. Now, let’s talk about this better-than-you-can believe house…. From No Crabs Allowed and Just a Little Crabbys’ spacious, shaded porches with swing and lots of seating, to the wider than usual doors and sit-in shower, the first floor is totally designed to be easy to navigate, so bring Grandma to the beach! Free, high-speed wireless Internet also makes it an easy getaway for anyone who needs to stay in touch. We are so close to the pool that our wireless Internet works all the way to the baby pool! Huge great room features flat screen TV with DVD, new furniture with lot’s of seating, electric fireplace with huge flat screen TV, dining area that seats 8, plus four bar seats. Hardwood floors, huge sisal rug and lots of designer touches set this house apart! Expansive kitchen is fully-equipped with new stainless appliances, granite counter-tops, ready for lots of cooks in the kitchen. Tommy Bahama-like first floor bedroom has queen bed,spacious storage and adjoining accessible bathroom. Multiple bricked patios and drives are perfect cook-out spots with gas BBQ grill available. Big porches with multiple, decorator ceiing fans and lots of seating invite you to relax and watch the world go by. Second floor features a 24’x 20′ master bedroom on the front of the house with its own big porch. Queen bed, entertainment center with flat screen TV, spacious closets and storage will convince you that you’ve arrived at the honeymoon suite of a five-star resort Roomy marble master bath features private jacuzzi! I set of bunk beds in private reading area on 2nd floor lets Mom and Dad keep a close eye on the little ones. Even the view from this room is impressive. The ‘Flamingo Room’ on the second floor features a double bed with lot’s of closet space and adjacent bathroom. But that’s not all…climb the stairs for the crowning glory of ‘No Crabs Allowed’…the sunset tower/party room. Wet bar, fridge,double futon, granite bar with stools and outside deck with seating will make you want to be here every day to enjoy spectacular sunsets over the gulf and get a pelican’s view of Seacrest Beach and neighboring estates. Buy anything you need 2 miles east at Winn-Dixie or Publix, then stay out of your car for the entire time if you want to…no Destin-area traffic here! 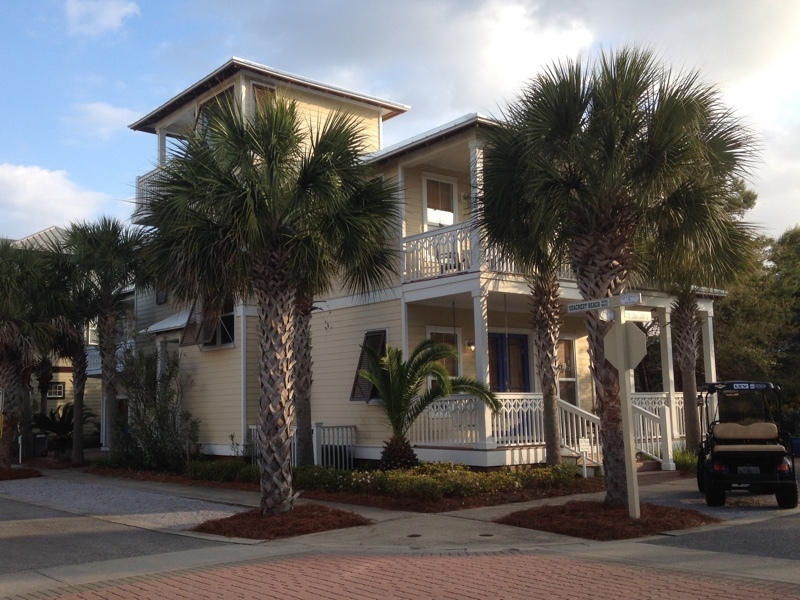 But just in case you decide to venture from the house, pool and beach…bike or walk to nearby Villages of South Walton and Rosemary Beach with their ice cream, candy and interesting retail stores, and multiple restaurants. There are art fests and performances on many weekends…lots to do. If you just HAVE to get in your car, just 6 miles west on highway 30-A are the quaint and beautiful towns of Seaside, Watercolor, then Grayton Beach. Lots more shops, restaurants, wonderfully interesting and colorful places and people. 3rd floor: Bunk with double bed on bottom; single bed on top.